This bluesy voiced Big Apple singer recorded several discs with arranger/producer Larry Lucie in the 60s for various labels that he had stakes in. Her first release was a fine ballad Where Will I Find Him that had touches of the “girl group” sound about it, but which is firmly on the right side of mawkish. Her third 45 is in a different class however. Time Is Awastin’ is a first class deep soul side, featuring Lucie’s classy guitar lines and well structured horn support. Susan’s low toned world weary vocal is just right. 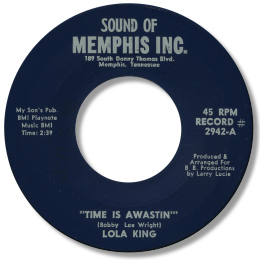 The side was licensed to the Sound Of Memphis label (not related to the XL concern) and reissued under the name of Lola King – now a highly prized 45 in deep circles. The location of this second release and its label accounts for the misconception that this 45 was recorded in Tennessee. 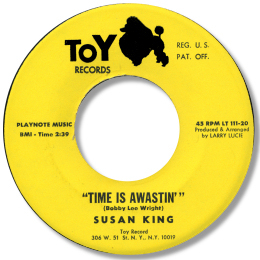 Of Susan’s later material the bouncy “Tell Her (Or Let Me Go)” is the pick of the bunch. Lawrence “Larry” Lucie is a very interesting figure. Born in 1907 he played guitar with such jazz figures as Louis Armstrong and Duke Ellington before becoming a very busy session man in the 50s and 60s. He was still active in the new millennium. His wife was the jazz/blues singer Nora Lee King. Could Susan be their daughter? UPDATE ~ Tim has written with details about Toy 104 "the same tunes but different mix/takes. The label is red instead of pink." I'm grateful to Tim for writing to me.